EmpeROAR Fabulous!!! is a vocalist, songwriter, burlesque performer, and emcee based in Seattle, Washington. His whip clever and tongue in cheek songs are carried on vocals with a wide range, and delivery spanning sweet to gruff to flamboyantly cartoonish. As an emcee, his trademark is ridiculous narratives that turn tangents into points, line by line. 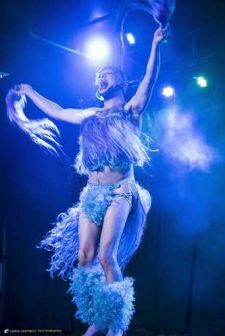 As a burlesque performer, his camp, comedy, and sass have girded him with trophies and sashes from near and not-quite-so-near, television appearances (America’s Got Talent), and has made him a flaming figure of the festival circuit, who’ll fire your fuse and explode your senses. His exclamations will leave you marked!